The Grinder Stone sharpens so fast, it can take the place of a grinding wheel! There are times when you want fast sharpening and no stone seems coarse enough. That is where the Grinder Stone excels. Not only is it probably the largest sharpening stone you’ve ever seen, but it is also probably the coarsest and fastest sharpening. The large size and coarse grit gives it incredible cutting speed. It was conceived as an alternative to the grinding wheel. However, unlike a spinning grinding wheel, the Grinder Stone will never burn your edge as is common when using a grinding wheel. 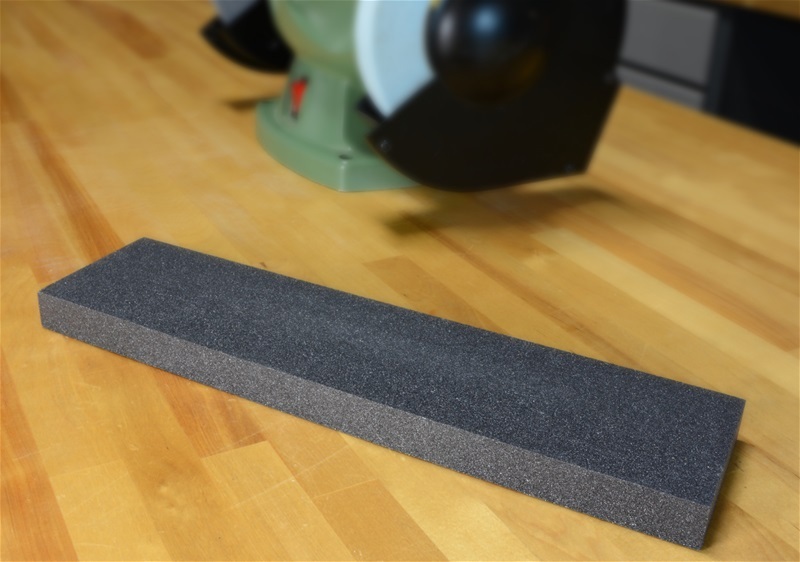 We recommend The Grinder Stone when you need to remove material efficiently, such as an extremely dull edge, a damaged edge or when you want to change the angle of an edge. The most common uses are for woodworking tools, garden tools and large knives. The Grinder Stone features 80 grit silicon carbide abrasive material for extremely fast cutting. For best performance, we recommend using water with this stone. The Grinder Stone is a Sharpening Supplies exclusive, you won't find anything like it anywhere else. The stone measures 12” long, 3” wide and ¾” thick. The one-foot length qualifies it to be part of our One Foot Stone line. However, because this stone is so distinctive in use from other stones, we simply call it The Grinder Stone. Q. Can this be used on any edge? A. While it is a very fast sharpener, some edges are just not designed to be sharpened quickly. It works great for tools and other durable edges. However, very fine cutlery and straight razors would not be appropriate for this stone. Q. Do you recommend a base or holder for this stone? A. Yes, we have a new longer holder to accommodate this stone. It is available separately.